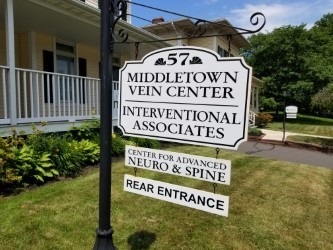 The Middletown Vein & Aesthetic Center (MVAC) has been offering minimally invasive outpatient treatment for varicose veins and spider veins since 2005. We provide thorough initial screenings and venous ultrasounds. Varicose vein procedures are a commonly covered treatment option, and we participate with almost all insurance companies, including Medicare and Medicaid. Dr. Michael Johnson, Board Certified Interventional Radiologist, and Anna Gatewood, PA-C, will provide a comprehensive examination including a bilateral leg ultrasound to create an individualized treatment plan for you based upon the findings. Based on your results, radiofrequency ablation is an innovative office treatment to treat the root cause of your symptoms. Patients can resume normal activity almost immediately. Ambulatory phlebectomy is also an office procedure for the larger surface varicose veins where needle punctures are so small that stitches are not necessary and there is virtually no scarring. Additionally, we offer treatment with sclerotherapy, ohmic thermolysis and topical laser to eliminate spider veins of the legs and face. Patients are increasingly pleased with not only their symptomatic improvement but also their cosmetic improvement. As our patient requests have expanded, so have our services. We offer free aesthetic consultations to help you achieve your desired aesthetic results. Anti-aging treatments include Botox to reduce the appearance of wrinkles, Juvederm and Voluma to smooth skin and restore volume, and Kybella to reduce double chin. We also offer affordable laser hair removal, sunspot removal, skin tightening and laser treatment for nail fungus with our new state of the art laser. We look forward to helping you achieve your aesthetic goals in a trusted, compassionate and innovative medical setting. Whether it be comprehensive vein care or compassionate aesthetic treatments, we have innovative and affordable options available.